Physically, FOTOCAT is an Excel file of UFO and IFO cases where an image was obtained in photography, film or video. Contains various data columns to record the date , time, place , province and country, explanation (if any) , photographer's name, special photographic features , references, etc. . When completed , the full catalog will be accessible from the Internet for free consultation of the worldwide UFO community. Today , the bank data FOTOCAT reached the figure of 6,908 reports , representing a modest but steady increase of 158 cases from the previous quarter. I remember the catalog ends on December 31, 2005 . We have completed the second technical report produced FOTOCAT data . It is available to all readers in two versions , English and Castilian -, so you just have to click the Research Papers section of this Blog: Argentina, The year 1965 in Photos . This work represents the most thorough comprehensive collection of UFO photographic cases generated wave in Argentina during 1965. The key components of this test are the summaries of the cases , the results of recent research on the sightings , a rich graphical support and analysis of the period under study. This section reports contributions received from new collaborators ( or regular ones which are relevant recent contributions ) . In addition to those cited here, many others are regularly contributing to the growth of FOTOCAT . Thank Guatemala colleague Gerardo E. Mendoza Palacios information provided concerning photographic observations in your country. In the process of establishing the complex panorama of photographs and films taken in New Zealand in the period December 1978 to January 1979, Dr. Bruce Maccabee has helped us with advice and sending an unpublished essay written in 2005 entitled A History of the New Zealand Sightings of December 31 , 1978. In this section some UFO photographs from past decades with a new interpretation will be reviewed. 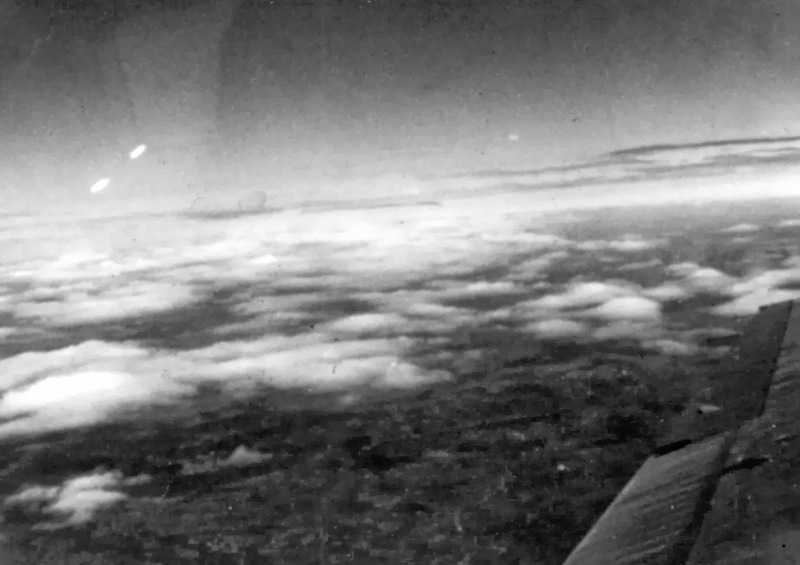 It is no longer unusual to find old photographs of UFO - fifties , for example - that are unknown to the specialist. But this one just happened when the skeptical French Raoul Robé ( member groups as notable CNEGU and SCEAU ) referred to this chart FOTOCAT Project document, published in the magazine Point de Vue . Images du Monde , corresponding to August 21, 1952 , page 31. Shows a pair of UFOs over an eminently tourist site of the capital of Spain in 1952. In summary, the brief note accompanying the photo says noted French illustrator Jean Boullet he took the photograph " three weeks ago ." I was photographing this monument to Cervantes with the figures of Don Quixote and Sancho Panza when a passerby asked if he had seen flying saucers , to which he replied no. However, if the film got . 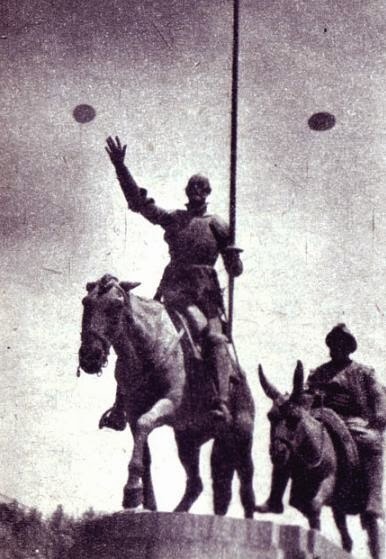 The opportunity to take scenic seems that exceeds any random chance , and considering the author's profession , so I'm afraid that some form of trick has been implemented in order to show Don Quixote fighting the flying discs . We note that in 1953 , the painter Jean Boullet authored the book D'Icare aux Soucoupes Volantes , a picture book by hand on the history of air traffic and aviation , with a series of drawings of flyers at the end plates. 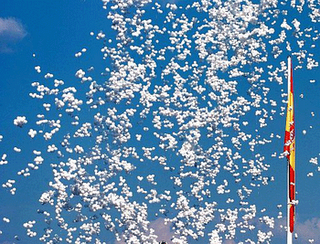 The profuse research Pacheco as well as other scholars and amateur astronomer Carlos A. Demaria , proved beyond reasonable doubt that it was the overflight of a balloon 40 feet in diameter infrared MIR research (Montgolfier Infrarogue) of French CNES , which has been confirmed conclusively by this scientific institution . There I found an unpublished document from the photographic collection of Roberto Enrique Banchs generously donated to FOTOCAT Project. The Argentina Air Force fighter moved to recognize the UFO that had entered its airspace. Since military aircraft pictures were taken and one which is presented below , as our own original contribution to this sighting. Among other things, we learned that the author of the film was really Raun Conradi , a partner of Mr. Björnulf . This section will display directly sightings reported to FOTOCAT . More on " UFO last picture of Poland"
In the previous update of this blog I presented a series of photographs taken in Poland on January 8, 2006 I was referred by a local research group . As the photos I beyond the temporal scope of this catalog do not intend to give the event more coverage , except to provide a recent report in English by Wojciech Bobilewicz on the alleged sighting , for the benefit of interested readers (click here) and pass some comments received from Nick Balaskas , Department of Physics and Astronomy at the University of York in Toronto (Canada ) . For this, I refer the reader to the English section (above). Entirely left to the reader to form their own judgment about this intricate story . Some basic statistics derived from FOTOCAT . After the United States ( 1,987 records) and Argentina ( 745 records) , Spain is the third largest contributor of cases to FOTOCAT spreadsheet with 622 records. As more groups and individuals to commit to the goals of the project FOTOCAT , we expect these numbers to increase in the future , until a comprehensive view of the " UFO phenomenon in photos " in Spain is reached. I reiterate my invitation to all national ufologists . Regularly we will include some work on curious phenomenology we deem of interest to disclose . A brief report for the serious researcher and critical . Sources of information selected judge of interest to acquire knowledge from a scientific perspective orientation. Organized by the Italian Committee for Project Hessdalen ( ICPH , according to its acronym in English ) , on June 17 took place at the visitor center Medicina radiotelescope in Bologna (Italy ) an international workshop on Project Hessdalen . Nine formal lectures were presented and also submitted several short papers , by a team of researchers from Norway, France and Italy. For details of this specialized symposium , see the link below http://www.itacomm.net/PH/NewsLetter_complex.pdf . Latest news: The September 16, 2006 , Jader Monari and Fiocchi Franco (INAF / IRA , Radiotelescopes Medicine , Bologna ) visited Hessdalen , where they were joined by Erling Strand and Bjørn Hauge Gitle ( Østfold University College, Halden , Norway ), its group and students. The main objective of the mission was established during the recent international workshop on Hessdalen : incorporate new tools for collecting data in the Automatic Measurement Station , and update existing software instrumentation . The mission lasted seven days. Thank Renzo Cabassi ( ICPH ) this information. To contact the organization can be written to this address : cabassi@itacomm.net . The website is in ICPH : http://www.itacomm.net/PH . Willy Smith, en casa del primero. The July 11, 2006 , Dr. Willy Smith died in Miami after a short illness. We were good friends and on his first trip to Spain in 1967 , we have evidence that Miguel Guasp and exercised an important influence. Known primarily for the development of UNICAT , a catalog of nearly a thousand high strangeness UFO sightings , which developed with Dr. J. Allen Hynek , who was joined by a strong friendship until his death. Great debater , uncompromising character , fought with everyone who did not come to agree with him and , unfortunately , after a quarter century of understanding also was my turn. But I prefer to remember you when I visit home , when they met with my colleagues, when I passed in July 1993 a conference at his home in Florida or eating seafood paella with my family at the beach Malvarrosa . Rest in Peace , Willy ! 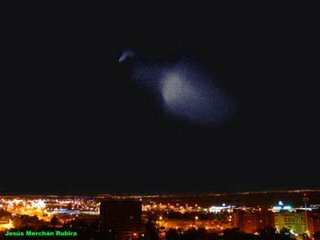 On 23 July, Vicente Fuentes Rodriguez, a 3rd year industrial engineering from Madrid and " amateur UFO investigator ," wrote the Anomaly Foundation an e- mail on behalf of a person ( the initials NG) had got a recording of 1000 or 2000 bright objects in the sky over Madrid on 10 June 2006 at 19.15 hours . Our correspondent described the scene , which he watched from the neighborhood of El Pilar, as " UFO formation with its own light emission , formation of geometric figures , smart move , UFO groups merging " etc. . In sum , described the recording of " perfect " and requested our help to spread it. This stunning photograph of the newspaper El Mundo realizes instantly launching balloons. Surely these balloons were also what JM photographed that afternoon from Las Rozas , a town less than 20 kilometers west of Madrid , reaching confuse observer who appreciated as 40 or 50 round objects moved from SE to NW quite high (the direction of the winds that day was ESE to WNW ) . 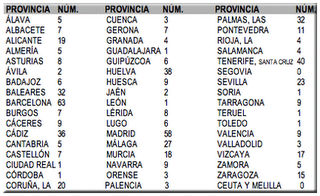 Las Rozas on 10/6/06 . Returning to our initial correspondent , the student who sent us the recording, he writes in September that " after months of study ... I ended up agreeing with you that makes sense ... watching the video records the cloud of balloons ... the direction of wind and recording location and time agree and direction , according to the Meteorological Institute to which I have directed to investigate it personally. " I welcome the change of heart. © Jesus Merchan Rubira , Deneb Astronomical Association , 2/6/2004 . "I was looking at NW when that object began to glow . At first it seemed an airplane is moving horizontally with → North West direction at about 23 degrees elevation above the horizon. The object visible to the naked eye and long, began leaving behind a cloud of smoke or gas, as queue very open comet, which grew to occupy a sky area of about 10 º x 10 º . Both the object and the cloud had a yellowish hue . It was then that I saw clearly that object began to turn on itself and has to describe an erratic trajectory rising above the horizon and continuing its westward . After this event , very impressed as I thought it was an accident, hastily prepared my tripod and camera equipment . The time of maximum magnitude was precisely at that moment , while the object was tumbling out of control through the atmosphere. When I set the material, the whole had lost enough brightness and object had already disintegrated into several fragments that descended very slowly ( it took 3 or 4 minutes to reach the horizon ) less than the initial object brightness , that it is the time captured by the only picture I could take. " The official statement from the French Ministry of Defence , issued June 3 , indicated that the joint training exercise of the Directorate General of Armaments ( DGA ) and the French Navy was part of the campaign to prepare the nuclear submarine Le Vigilant , equipped with ballistic missiles. During the flight several initiatives for the future replacement for the M51 M45 missile in early 2010 technological innovations were tested. The shot was monitored from the Testing Center Landes (CEL ) and telemetry from the ship Monge. I appreciate the information provided by Jean -Jacques Serra , a scientist at the Directorate General of Armaments ( DGA ) of the French Defense Ministry , Dr. Jonathan McDowell , director of the Smithsonian Center for Astrophysics (Harvard University) , by Dr. Ed Cannon University of Texas, and Jose Maria Navarro , Madrid. http://eol.jsc.nasa.gov/sseop/clickmap/ is the link to the NASA site "Gateway to Astronaut Photography of Earth ." Welcomes the best and most comprehensive collection of photographs of the Earth collected by astronauts from 1961 to the present. You can browse through the collections of photographs to select the most impressive images and click on an Earth map with blocks of 2.5 x 2.5 degrees to find the photos available from this geographical area . And for those more familiar with this database , you can perform search techniques that allow complex searches across multiple fields. Definitely a very useful tool. Supply you regional , provincial or national for review and enlarge . For those readers who live in Valencia and want to do volunteer work , I invite you to write . A día de hoy, el banco de datos FOTOCAT alcanza la cifra de 6.908 informes, lo que supone un modesto pero imparable incremento de 158 casos desde el pasado trimestre. Recuerdo que el catálogo finaliza el 31 de diciembre de 2005. Hemos completado el segundo informe técnico producido con los datos de FOTOCAT. Está disponible para todos los lectores en dos versiones -en inglés y en castellano-, para lo que sólo hay que hacer click en la sección de Documentos de este Blog: Argentina, el año 1965 en fotos. Este concienzudo trabajo supone la recopilación más exhaustiva de los casos ovni fotográficos generados en Argentina durante la oleada del año 1965. Los componentes fundamentales de este ensayo son los resúmenes de los casos, los resultados de investigaciones recientes realizadas sobre los avistamientos, un abundante apoyo gráfico y el análisis del periodo bajo estudio. Agradecemos al colega de Guatemala Gerardo E. Mendoza Palacios la información facilitada concerniente a observaciones fotográficas en su país. En el proceso de establecer la compleja panorámica de fotografías y películas tomadas en Nueva Zelanda en el periodo que va de diciembre de 1978 a enero de 1979, el Dr. Bruce Maccabee nos ha ayudado con consejo y con el envío de un ensayo inédito escrito en 2005 titulado A History of the New Zealand Sightings of December 31, 1978. No es ya corriente encontrar viejas fotografías ovni –una de los años cincuenta, por ejemplo- que sean desconocidas al especialista. Pero esto mismo acaba de suceder cuando el estudioso escéptico francés Raoul Robé (miembro de notables agrupaciones como el CNEGU y el SCEAU) remitió al Proyecto FOTOCAT este documento gráfico, publicado en la revista Point de Vue. Images du Monde, correspondiente al 21 de agosto de 1952, página 31. Muestra un par de ovnis sobre un emplazamiento eminentemente turístico de la capital de España en 1952. En resumen, la breve nota que acompañaba la foto dice que el conocido ilustrador francés Jean Boullet tomó él mismo la fotografía “hace tres semanas”. Estaba fotografiando este monumento a Cervantes con las figuras de Don Quijote y Sancho Panza cuando un viandante le preguntó si había visto los platillos volantes, a lo que él replicó que no. Sin embargo, la película si los recogió. La oportunidad escenográfica de la toma me parece que excede cualquier probabilidad aleatoria, y más considerando la profesión del autor, así que me temo que alguna forma de trucaje se ha puesto en práctica con el fin de mostrar a Don Quijote luchando contra los discos volantes. Hacemos notar que en 1953, el pintor Jean Boullet fue autor del libro D'Icare aux Soucoupes Volantes (De Ícaro a los platillos volantes), un libro de ilustraciones a mano sobre la historia del tráfico aéreo y de la aeronáutica, con una serie de dibujos de platillos volantes al final. El recomendable sitio web del investigador argentino Luís Eduardo Pacheco, acaba de hacer disponible al fin la serie completa de las excelentes fotografías tomadas por el técnico fotógrafo Guillermo E. Sierra desde el Observatorio de la Universidad Nacional de la Plata (Buenos Aires, Argentina) del objeto que fue visto en aquella memorable mañana del 17 de septiembre de 1985: http://stratocat.com.ar/artics/1709/17906.htm. Las profusa investigación de Pacheco, así como la de otros estudiosos como el astrónomo aficionado Carlos A. Demaría, demostró más allá de toda duda razonable que se trató del sobrevuelo de un globo de 40 metros de diámetro de investigación infrarroja MIR (Montgolfière Infrarouge) del CNES francés, lo que ha sido confirmado fehacientemente por esta institución científica. Hay un documento inédito que encontré entre la colección fotográfica de Roberto Enrique Banchs, generosamente donada al Proyecto FOTOCAT. La Fuerza Aérea argentina desplazó un caza para el reconocimiento del ovni que había entrado en su espacio aéreo. Desde el avión militar se tomaron fotografías y una de ellas es la que presento a continuación, como nuestra propia aportación original a este avistamiento. Entre otras cosas, nos hemos enterado que el autor de la película fue realmente Raun Conradi, un socio del señor Björnulf. Esta sección expondrá una muestra de los avistamientos directamente comunicados a FOTOCAT. En la actualización anterior de este blog presenté una serie de fotografías tomadas en Polonia el 8 de enero de 2006 que me fueron remitidas por un grupo de investigación local. Como las fotos escapan del ámbito temporal de este catálogo, no tengo la intención de darle al suceso mayor cobertura, con la excepción de aportar un reciente informe preparado en inglés por Wojciech Bobilewicz sobre el presunto avistamiento, para beneficio de los lectores interesados (pinchar aquí), así como transmitir unos comentarios recibidos de Nick Balaskas, del departamento de Física y Astronomía de la Universidad de York, en Toronto (Canadá). Para ello, remito al lector a la sección en inglés (arriba). Dejo enteramente al lector que se forme su propio juicio acerca de esta intrincada historia. Después de los Estados Unidos (1.987 registros) y Argentina (745 registros), España es el tercer contribuyente de casos a la hoja de cálculo de FOTOCAT, con 622 registros. A medida que más agrupaciones y particulares se comprometan con los objetivos del Proyecto FOTOCAT, esperamos que estos números aumenten más en el futuro, hasta que se alcance una visión exhaustiva del “fenómeno ovni en fotos” en España. Reitero mi invitación a participar a todos los ufólogos nacionales. Organizado por el Comité Italiano para el Proyecto Hessdalen (ICPH, según sus siglas en inglés), el pasado 17 de junio tuvo lugar en el centro de visitantes del Radiotelescopio de Medicina, en Bolonia (Italia) un taller internacional sobre el Proyecto Hessdalen. Se dictaron nueve conferencias formales y se presentaron además varias comunicaciones breves, por parte de un equipo de investigadores de Noruega, Francia e Italia. Para más detalles de este simposio especializado, véase el siguiente enlace: http://www.itacomm.net/PH/NewsLetter_complex.pdf. Últimas noticias: El 16 de septiembre de 2006, Jader Monari and Franco Fiocchi (INAF/IRA, Medicina Radiotelescopes, Bolonia) visitaron Hessdalen, en donde se les unió Erling Strand y Bjørn Gitle Hauge (Østfold University College, Halden, Noruega), su grupo y estudiantes. El objetivo principal de la misión quedó establecido durante el reciente taller internacional sobre Hessdalen: incorporar nuevos instrumentos de recogida de datos en la Estación Automática de Medición, así como poner al día el software de las instrumentaciones existentes. La misión duró siete días. Agradezco a Renzo Cabassi (ICPH) estas informaciones. Para entrar en contacto con la organización puede escribirse a esta dirección: cabassi@itacomm.net. La página web del ICPH se encuentra en: http://www.itacomm.net/PH. 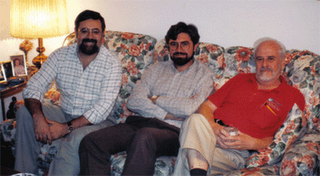 De izquierda a derecha: Vicente-Juan Ballester Olmos, Miguel Guasp y Willy Smith, en casa del primero. El 11 de julio de 2006, el doctor Willy Smith murió en Miami después de una corta enfermedad. Fuimos muy amigos y en su primer viaje a España en 1967, tengo constancia que Miguel Guasp y yo ejercimos una importante influencia. Conocido principalmente por el desarrollo de UNICAT, un catálogo de cerca de un millar de avistamientos ovni de alta extrañeza, que elaboró con el doctor J. Allen Hynek , con quien le unió una fuerte amistad hasta su muerte. Gran polemista, de carácter intransigente, se peleaba con todos los que no llegaban a coincidir con él y, por desgracia, tras un cuarto de siglo de entendimiento llegó también mi turno. Pero prefiero recordarle cuando me visitaba en casa, cuando se reunían con mis colegas, cuando pasé en julio de 1993 unas jornadas en su hogar de Florida o comiendo paella de marisco con mi familia en la Playa de la Malvarrosa de Valencia. ¡Descansa en Paz, Willy! El 23 de julio pasado, Vicente Fuentes Rodríguez, estudiante de 3º de ingeniería técnica industrial de Madrid e “investigador aficionado de ovnis”, escribía a la Fundación Anomalía un mensaje de correo electrónico en nombre de una persona (cuyas iniciales son N.G.) que había conseguido una grabación de 1000 o 2000 objetos brillantes sobre el cielo de Madrid el 10 de junio de 2006 a las 19,15 horas. Nuestro comunicante describió la escena, que él mismo observó desde el barrio de El Pilar, como “formación de ovnis con emisión de luz propia, formación de figuras geométricas, movimiento inteligente, agrupaciones de ovnis que se fusionan”, etc. En suma, calificó la grabación de “perfecta” y solicitaba nuestra ayuda para difundirla. Esta impresionante fotografía del periódico El Mundo da cuenta del instante del lanzamiento de los globos. Seguramente estos globos fueron también lo que J.M. fotografió esa misma tarde desde Las Rozas, localidad a menos de 20 kilómetros al Oeste de Madrid, llegando a confundir a observador, que apreció como 40 o 50 objetos redondos se desplazaban de SE a NW a bastante altura (la dirección de los vientos aquel día era de ESE a WNW). Detalle de uno de los objetos de las fotografías tomadas desde Las Rozas el 10/6/06. Volviendo a nuestro corresponsal inicial, el estudiante que nos mandó la grabación, éste nos escribe en septiembre que “tras unos meses de estudio…he acabado coincidiendo con usted en que el avistamiento tiene lógica…el video registra la nube de globos…la dirección del viento y la localización y la grabación coinciden en hora, dirección y sentido, según el Instituto de Meteorología al que me he dirigido para investigarlo personalmente”. Me alegro del cambio de opinión. © Jesús Merchán Rubira, Agrupación Astronómica Deneb, 2/6/2004. “Estaba mirando al NW cuando aquel objeto comenzó a iluminarse. Al principio parecía un avión; se desplazaba horizontalmente con rumbo Norte→Oeste a unos 23º de elevación sobre el horizonte. El objeto, visible a simple vista y alargado, comenzó a dejar tras de sí una nube de humo o gas, en forma de cola de cometa muy abierta, que fue creciendo hasta ocupar un área en el cielo de unos 10º x 10º. Tanto el objeto como la nube tenían una tonalidad amarillenta. Fue entonces cuando vi claramente como aquel objeto comenzó a girar sobre sí mismo y ha describir una trayectoria totalmente errática elevándose sobre el horizonte y continuando su rumbo al Oeste. Tras este suceso, muy impresionado pues creí que se trataba de un accidente, preparé a toda prisa mi trípode y equipo fotográfico. El momento de máxima magnitud fue precisamente en esos instantes, mientras dicho objeto se encontraba fuera de control dando tumbos por la atmósfera. Cuando tuve listo el material, el conjunto había perdido bastante brillo y el objeto se había desintegrado ya en varios fragmentos que descendían muy lentamente (tardaron 3 ó 4 minutos en alcanzar el horizonte) con un brillo menor al del objeto inicial; ése es el instante captado por la única fotografía que pude tomar”. El comunicado oficial del Ministerio de Defensa francés, emitido el 3 de junio, señalaba que el ejercicio de entrenamiento conjunto de la Dirección General de Armamento (DGA) y la Marina francesa formaba parte de la campaña de preparación del submarino de propulsión nuclear Le Vigilant, equipado con misiles balísticos. Durante el vuelo se probaron varias innovaciones tecnológicas tendentes al futuro reemplazo del misil M45 por el M51 a principios de 2010. El disparo fue monitorizado desde el Centro de Ensayos de Las Landas (CEL) y desde el navío de telemetría Monge. Agradezco las informaciones facilitadas por Jean-Jacques Serra, científico de la Dirección General de Armamento (DGA) del Ministerio de Defensa de Francia, del Dr. Jonathan McDowell, director del Smithsonian Center for Astrophysics (Harvard University), por el Dr. Ed Cannon, de la Universidad de Texas, y por José Mª Navarro, de Madrid. http://eol.jsc.nasa.gov/sseop/clickmap/ es el enlace del sitio de la NASA “Gateway to Astronaut Photography of Earth”. Acoge la mejor y más completa colección de fotografías de la Tierra conseguidas por los astronautas desde 1961 hasta el presente. Se puede navegar a través de las colecciones de fotografías para seleccionar las imágenes más impresionantes, así como pinchar en un mapa terrestre con bloques de 2,5 x 2,5 grados para hallar las fotos disponibles de esa zona geográfica. Y para los más familiarizados con esta base de datos, se pueden realizar búsquedas técnicas que permiten búsquedas complejas a través de múltiples campos. Definitivamente una herramienta muy útil. Solicitamos su colaboración altruista con el Proyecto FOTOCAT. Por favor escríbanos a: ballesterolmos@yahoo.es.